After the not-so-well received G5 flagship, LG today introed a new, and can we say a rather important device that definitely needs to show that LG still has the mojo. 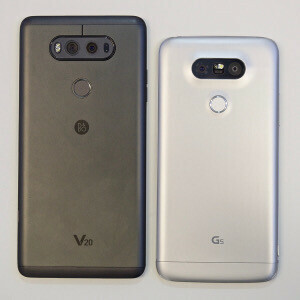 The LG V20 seems busting with potential, especially for all those that cherish listening to and recording hi-fi audio thanks to the 32-bit quad DAC with deliciously-low levels of THD (Total Harmonic Distortion) and high-quality microphones. But we are dealing with a smartphone, after all, so we felt compelled to both its predecessor, the V10, and LG's current flagship, the G5. Time for a specs comparison! Aperture size: F1.8; Focal length: 29 mm; Sensor size: 1/2.8"
Aperture size: F2.4; Focal Length: 12 mm; Sensor size: 1/3.2"
All the seem to be same..
LG makes good phones but falls short of that one or two features that can make it stand out and compete with Samsung flagship. Think if the Note 7 fire fiasco wasn't there, v20 wouldn't stand a chance against it. Not sure if LG is prepared to release it immediately to take advantage of Note 7 sales halt. If not, give Samsung couple of weeks, they will bounce back with the new lot and make up lost ground. No practically no difference. Useless phone. Anyone else notice the G5 has a superior front-facing camera? Why didn't the V20 get that same camera?